What’s wrong with that image? It’s far better than the awful John Blanche garbage. Don’t want none; don’t start none. Horus is just lucky the chaos gods gave him a steroid cocktail- normal Horus would get stomped by Sanguinius. I look forward to Dante murdering Abbadon as revenge in the modern era. Newcomer to the Warhammer lore here. 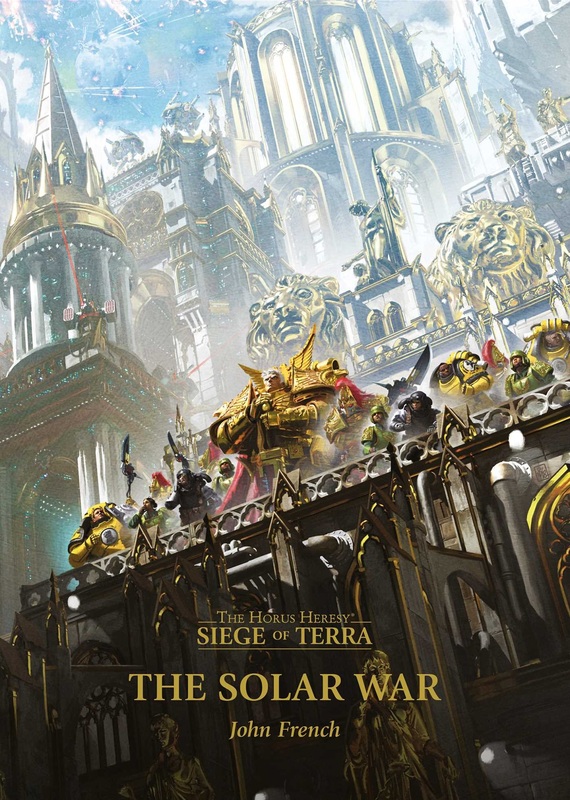 Does games workshop have an online version of black library for all books? Something like what Marvel and DC have for their comics with a sub? How is there digital is their service? No, currently they sell epubs of their books on their website or at any digital bookstore. No subscriptions to their books. 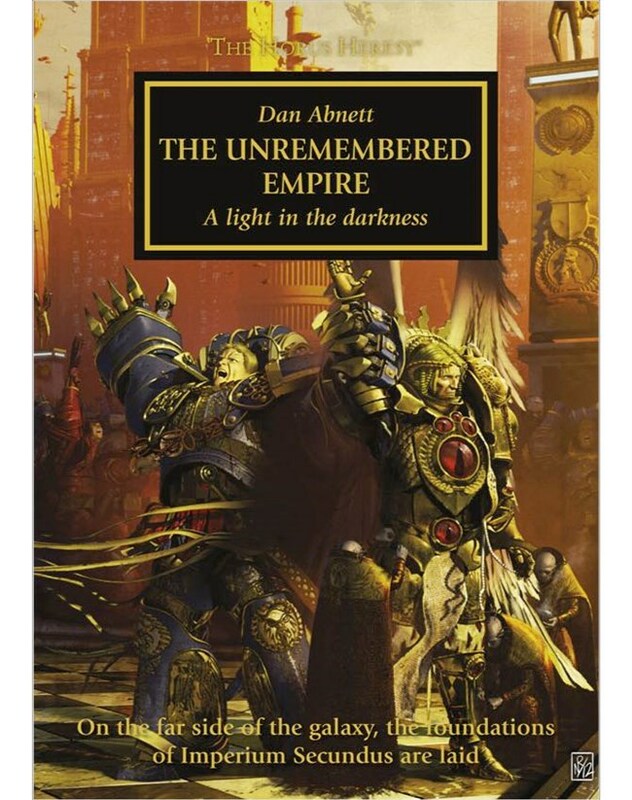 I believe they have most of the Horus Heresy and their other novels for digital distribution on Black Library- but you'll pay a pretty penny for them. Many of the books are slowly being released on Amazon for Kindle and on Audible. That's where I've been going. is the scale right here with Dorn? 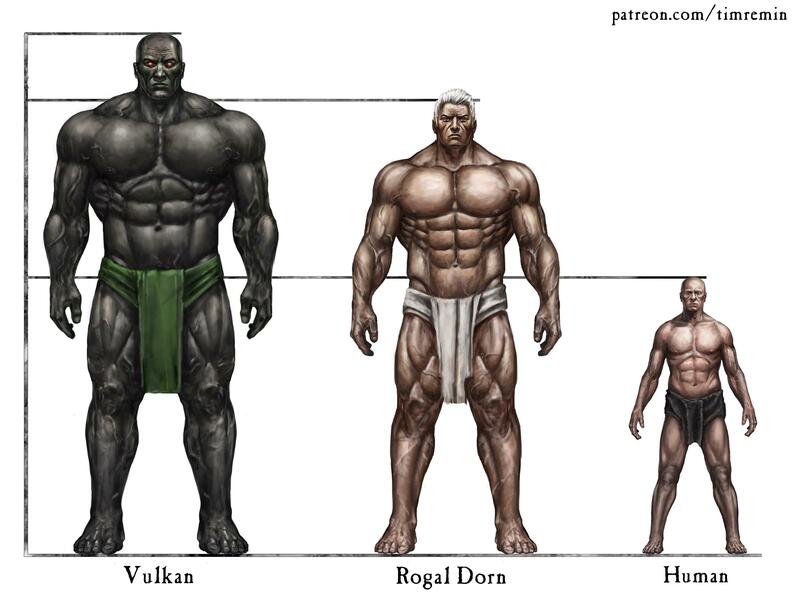 There is only one rule involving the consistency of height among Space Marines and Primarchs....and that's that there is no consistency among Space Marines and Primarchs. No. Not really. Astartes to Primarch is roughly the same difference as regular human to Astartes. But this rule doesn't apply to every Primarch. There is big variety in Primarch height. For example Alpharius is said to be roughly the same size as a Space Marine, while Magnus and Vulkan tower over the rest of the Primarchs. Custodes are the ones slightly larger than Astartes. That said the art can be inconsistent in regards to height. Um, way way more than 3 or 4 Astartes. Primarchs are practically unkillable gods. They only seem to die when facing an equal level threat or when they want to. Reminder that the Forgeworld models of Fulgrim and Ferrus Manus are designed to go to gether and Manus's head is designed to be chopped off. so do we all agree he was a terrible father? More of an absentee one. Some of his decisions were questionable (Angron, Kurz), but his kids were also a mixed bag. Angron should have been killed or left to die if big E wasn't going to help him and his slave friends in their last stand. He had the custodes with him...and just chose to teleport Angron away so he could watch his friends die. For someone who has been around forever, he's terrible at understanding human emotions sometimes. He fucked up big time with Logar though. Is the Emperor human sized, space marine sized, or primarch sized? If he's either of the latter two, does that mean he roamed around human civilizations for centuries as 8 to 10 foot tall bodybuilder and we all just pretended like that was normal. I had the impression he used psyker powers to make himself seem larger than life. idk. But in all seriousness, I don't want to delve too deeply into explaining the ways the Emperor's contradictions matter or don't matter. They're there, and they're definitely formative - totally agree - if not exactly definitive. With the Emperor, a lot of interaction is about getting out what you put in. You get what you give. Your perceptions and expectations are reflected back on you because that's how the human brain perceives everything (a fact that cannot be overstated; the science behind it is fascinating and all-important), especially when you're talking about someone who exists on that plane of power. At one point the Emperor makes mention of the notion that he's not even speaking, that being near to him allows the conveyance of meaning through psychic osmosis, and communication telepathically. He's not even talking. It's raw understanding filtering through a mind, or just the way the mortal mind comprehends the aura of what the Emperor intends, or, or, or... That's what I mean. TMoM is littered with that stuff. Does he only address the primarchs by number instead of name? Some characters will swear he does that, and doesn't that just perfectly match their perspectives of the primarchs as either emotionally-compromised "too-human" things that think they're sons (Ra), or genetic masterworks that have become galaxy-damning screw-ups that have literally let the galaxy burn and brought the Imperium to its knees, leading people to be exiled from their homeworlds (Land). Do you think Sanguinius will agree? Or care that's what mortals think? The Emperor's portrayal on that isn't even consistent between Ra and Diocletian, two of his Custodians - and on PAGE ONE, the only time he interacts with a primarch himself, and the one and only thing he says to Magnus the Red is...? "Magnus." Like... that's a pretty strong indication that the interactions which follow are playing by different rules. Ra sees the Warlord of Humanity, just a man, but a great mean, weary and defiant, burdened by responsibility. Daemons see their annihilation, and go insane in his presence. 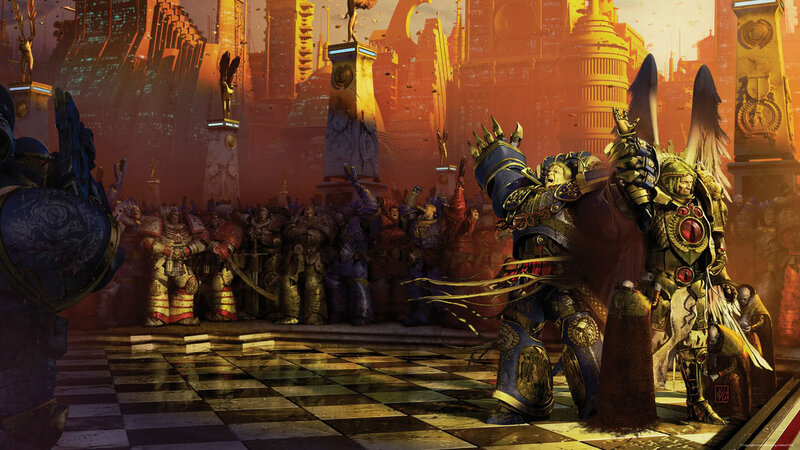 One of the Knights, as they're marching through the Throne Room, is caught in religious rapture, unable to do anything but stare at the glorious halo of the Emperor of Mankind on the Golden Throne. One of the Sisters of Silence, in the same room, literally just sees a man in a chair. Another character, not Imperial, asks a Custodian if the Emperor even breathes. She believes he's a weapon left out of its box from the Dark Age of Technology. (With thanks to Alan Bligh for that one, he adores that theory.) So I don't think it's exactly a spoiler to say that if and when I get to write a character like Sanguinius in the Emperor's presence, or Malcador, they'd have entirely different experiences than Ra and Land. I'd loved to have had that in TMoM, but as much as it would've given wider context, these aren't rulebooks and essays; it would've been self-indulgent for the sake of 'hoping people get it', and cheapened the story being told, which was ultimately in a very narrow and confined set of circumstances. Breaking out of that narrative would be offering a sense of scope and freedom I was specifically trying to avoid in a claustrophobic siege story. Because theme and atmosphere is a thing. hm... forgot about the blanks/nulls. Guess they should be able to see his actual physical manifestation. 1. Calgar is a primaris now? 2. What's a Thunder Warrior? 1. Calgar is a primaris now. 2. A Thunder Warrior is a proto-space marine that was used by the Emperor during the Unification Wars. they seem bigger? and i assume stronger than regular astartes? They are stronger, but not better. What the Thunder Warriors are is the Emperor's attempt in creating super soldiers that he would need later on. isn't the Age of Technology where we see the rise of the Emperor? There's the scouring as well. Retaking of Mars would actually be a big one. The Emperor of Mankind appeared during the Age of Strife. We already had the Mancharian conquest. They ever going to do something with the cacodominus? Who knows at this point. Most stuff in the background stuff in the rulebooks and codices are stuff that might be expanded up but that is really just up to Black Library. Primarchs are big lads. Regular humans come up to their hips while when standing next to a marine, regular humans come up to their chests. I'm sorry but that cover looks so ridiculously silly. the Smurfs and Angels are celebrating with their primarchs why the Scars are there just like "what ev"
For context, G-man is proclaiming his brother as the Emperor of Imperium Secundus (the worlds that got cut off from the rest of the Imperium by a huge Warp storm). Sanguinius isn't exactly thrilled about it, but knows he's the best choice for the job as they have no idea how to get out and if Terra even still stands.